Refer a friend and become a premium member for FREE. 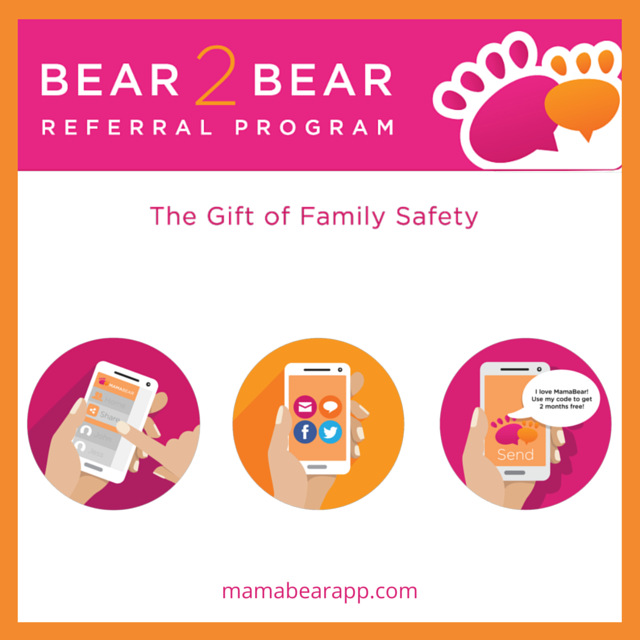 MamaBear’s customer referral program allows you to share an exclusive link with your favorite friends to give them the gift of MamaBear’s family safety app. With each new referred registration, your friends will receive free premium service and you will continue to extend your free premium service with every new friend that registers. Once your friends successfully create a new MamaBear family account, they will see their premium service expiration date in the settings/subscription area of the app menu. You will also receive a premium upgrade for the same period of time and see your expiration date extend with every registration tied to your exclusive link shared. The period of time may vary based on seasonal promotions, but the share message will say the time length of the upgrade. You and your friends will enjoy MamaBear’s premium service. Refer often, give the gift of safety and expand your peace of mind with MamaBear premium services. **Should you already be a premium subscriber, your expiration will be extended for the additional time. Premium service is applied to all family members on the same account. The referral program is for new family registrations only. If you’d like to add guardians to an existing account, please use the ‘Add Guardian’ option in the app menu.